Several of the important elements of early cinema come together to make up this short Edison Studios comedy directed by Edwin S. Porter. While much of the film is built on established formulas of the previous ten years, we also get a glimpse of some of the coming direction of American cinema, especially in the realm of slapstick. The movie essentially consists of three scenes, each in a separate location, and each shown in long shot by a stationary camera. 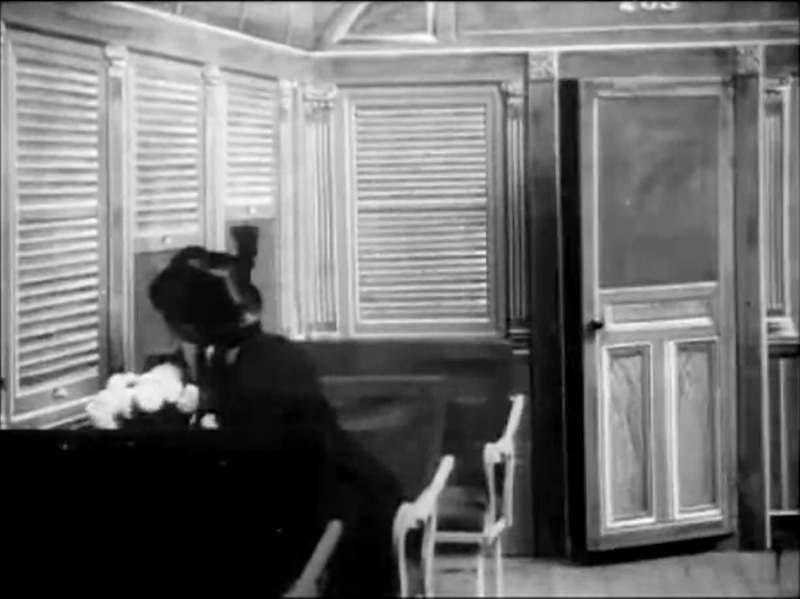 The first scene takes place in a train station, signaled by the closed “ticket” window on the left side of the stage. There is a man in “bumpkin” clothes asleep on a bench as the scene opens. Soon, another figure enters through the door beside the bench. This is “Nervy Nat,” and he is dressed in rather frayed and worn-looking evening clothes, with a top hat, and moves in broad gestures that suggest possible inebriation. He goes to the water cooler and pours a glass, confirming our suspicions when he spits it out, disappointed that it is unadulterated by liquor. Then, he notices our bumpkin character, and stealthily checks his coat pocket, pulling out a train ticket and absconding with it. 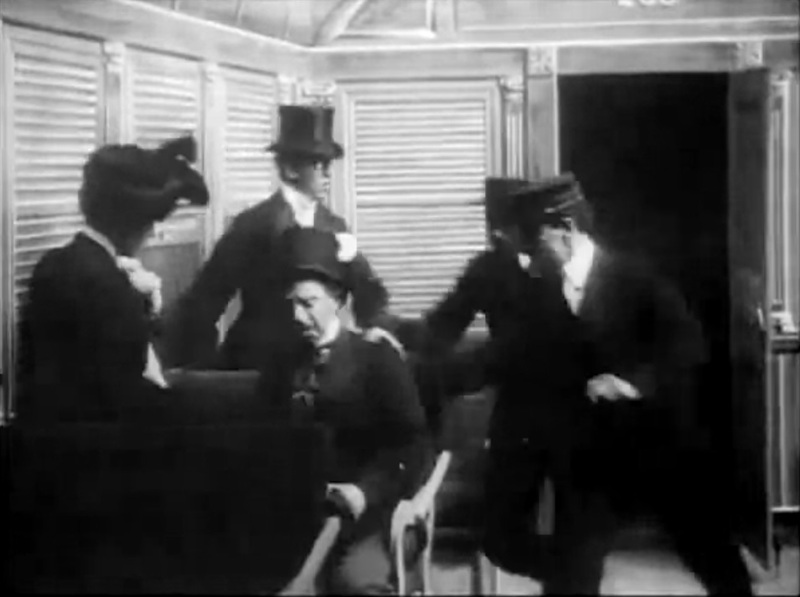 The next scene is aboard a train car, and two newlyweds are the only ones in the car at first. They are kissing, but the conductor comes in to warn them that another passenger will be joining them, and they assume a more demure posture. The new passenger is Nervy Nat, who takes the seat behind them. The husband pulls out a cigar, and invites his wife to join him for a smoke, but she isn’t interested, and they quarrel, the husband finally leaving when his wife turns to look away from him pointedly. Nervy Nat takes the opportunity to sit next to the woman, and tries to take her in his arms. She, still looking out the window, resists, presumably thinking that her husband is attempting an awkward apology. Then she turns and looks, and starts screaming, bringing the husband and two conductors back into the car, and they grab Nat and drag him out the door. The final scene is an exterior of train tracks, with a train rushing by. When the last car passes, we see two men hurl another off the back of the moving train. Nervy Nat gets up, dusts himself off and shakes his fist at the train before walking off. The movies, especially American movies, were still figuring themselves out at this time. While there had been artistic and commercial breakthroughs, like Porter’s own “The Great Train Robbery” from the year before, most of the movies seen in American theaters at this time were coming from Europe, mostly France. There was huge demand for new films, but American studios simply didn’t have the capacity to make enough pictures. This was only aggravated by the fact that the Edison company claimed to have the only legitimate patent for motion picture equipment in the USA, and was suing its competition left and right, even taking theater owners to court if they showed non-Edison content. The American film industry was in a fairly sorry state in 1904, but was beginning to function despite itself, due to the enormous audience interest in simple, entertaining stories. Porter successfully transported several pieces from “The Great Train Robbery” to this movie, made about nine months later. The locations – a ticket station, a train, and the train tracks – are similar in both films. The editing sequence is much simpler for this shorter movie, but still applies the same basic linear conventions we see in “Train Robbery.” Also the aspect of the train itself as a place where “outside” elements can invade and interrupt staid middle class lives is in common between the two. There is also a common special effect: the use of a jump cut and a dummy to simulate a body being thrown off a train. In the “Robbery” we see two men fighting on the back of the train, when one wins, the cut happens and he throws a dummy off. Here the sequence is reversed: we see the men throw the dummy off the train, there is an edit, and then Nervy Nat gets up where the dummy would have been. This combination of dummies and trick photography goes back at least as far as “The Execution of Mary, Queen of Scots,” an American movie, and such camera trickery would be perfected by Georges Méliès of France in the intervening years. I think Méliès would have done it a bit more smoothly by 1904, but I admit I had to re-run it to make sure I caught where the edit happened. The character of Nervy Nat, while not very fleshed-out in the run time of this movie, seems to herald future developments in American comedy. I was particularly reminded of Charlie Chaplin’s “Little Tramp” character, both by the behavior and the outfit of Nat. He is dressed up, but at the same time, obviously down and out. He drinks, he steals, he covets, and he has problems understanding social boundaries. In the end, his behavior brings worse trouble on his head. 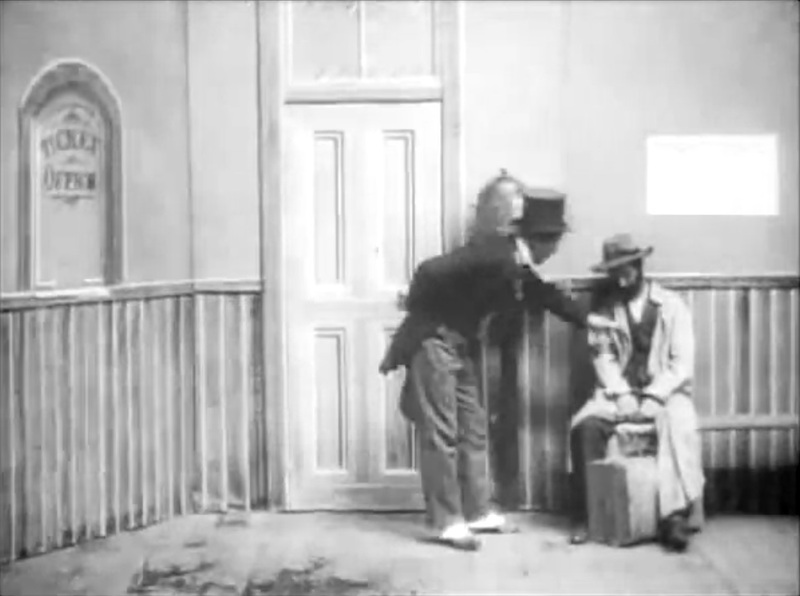 None of this is to say that Chaplin necessarily “stole” his idea from this movie (or even saw it), but it indicates the way that the “Little Tramp” was a part of an established comedic tradition; Chaplin had been doing “funny drunks” on stage for years, and he knew how best to make them funny. Nervy Nat can be seen as a slightly less effective attempt at doing the same thing. Perhaps not surprisingly for slapstick, the part that made me laugh was his ejection from the train. In light of the theme of this Blogathon, I should speak a little bit about the romantic side of this comedy. Of course, it is not meant to be a tragic story of love lost; from that point of view, Nervy Nat is simply too unsympathetic and the woman too obviously uninterested in his advances. Nat reminds us, however, as the “Little Tramp” would time and again in future movies, that even the most alienated and unsocialized of characters still want to be loved. Nat does not find his valentine at the end of this movie but the audience can leave with a sense of having learned from his mistakes and acknowledge the universal human need for affection. This has been my contribution to the “You Must Remember This…A Kiss is Just a Kiss Blogathon.” Don’t forget to check out the other entries! I agree Caftan Woman’s comment. There will always be another train + opportunities for Nervy Nat. After all, he’s not called that for nothing, I suspect. Thanks for the introduction to this character. I’d never heard of him before, and he sounds like an important character type in early cinema. Please let it be noted that Nervy Nat kept his top hat on as he was thrown from the train – not an easy thing to do. Thanks for a “valentine” post about an early masher! Good point! Happy to contribute. Nervy Nat sounds like quite the opportunist. There’ll be another train around shortly, and surely more brides who get peeved at their hubbies. Most illuminating, Michael, thanks for contributing to the blogathon! And thank you for hosting! It’s been a fun one.